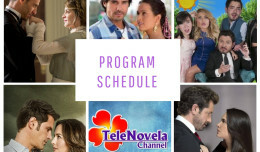 In the Name of Love: Episode 46 | TeleNovela Channel - Bringing you closer to lifes drama. Macarena tells Rufina that Cristobal isn’t a ghost and that she can’t believe Carlota faked his obituary. Meantime, Cristobal feels the same way and Paloma invites him to see her aunt. German rejects Romina’s offer to have him come to her house while Camila goes on a date with Orlando.